Andriani's Guest-House kohteessa Mykonos, Kreikka: Varaa nyt! 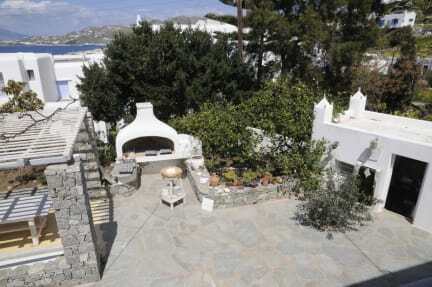 Andriani's Guest-House is Solar powered and located in Mykonos town on the wonderful island of Mykonos. Mykonos is located next to the famous centre of ancient Greece: Delos island. The guest house provide Wi-Fi HotSpot access and consists of 7 rooms, 3 studios and 1 apartment. Most of them renovated in 2015-2017 !! 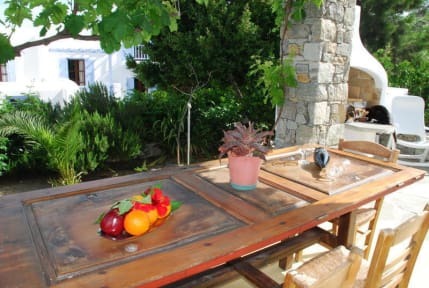 They are very comfortable and most of them have view of the town and the port of Mykonos. They all have private bathroom, Led TV, A/C, fridge, safe-box, daily maid service and WiFi. In the studios and apartment there is also a kitchenette. The rooms with view have an espresso coffee machine. Outside each room there is a balcony, yard or garden. There is also a cafe bar in where, our guests can have a coffee or a cold drink. The guesthouse is quiet & clean and the atmosphere is friendly and welcoming. Please note: If you need to cancel your booking, the cancellation policy of this property is 5 days. **** Check out:11:00, Check in:13:00 to 23:00.